The Ghana Federation of Labour is the latest to be disputing claims by the Akufo-Addo led government that all is well with the Ghanaian economy. The Federation believes the economic indicators put out by the government's Economic Management Team (EMT) led by Vice President, Dr Mahamadu Bawumia, is far from the reality in the Ghanaian market, and in the lives of the citizens. Mr Abraham Koomson, the General Secretary of the Federation, who made this known in an interview on Radio XYZ 93.1 Tuesday morning argued that although the government had touted good economic fundamentals, the reality is hardship. "Anyone who says things are smooth in recent times may be a thief or someone who benefit from some dubious deals...People are suffering and the government says the economy is good. If things are well why are workers struggling to make ends meet?" Mr Koomson questioned. To him, if things were good and sound as the government want Ghanaians to believe then workers would not be complaining of hardship and lacking purchasing power, stressing " the fundamentals are not strong." His comment follows a Town hall meeting that was organised by the Economic Management Team (EMT) last week where Dr Bawumia announced the government had done well in managing the economy. 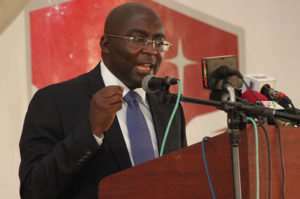 Dr Mahamudu Bawumia, among other things, attributed the recent depreciation of the Ghana cedi – one of the major challenges of the country’s economy – to directives from the International Monetary Fund (IMF). “So demands for foreign currency was not met by supply as normally happens on a day-to-day basis, and we know when the demand is greater than the supply or the supply is not coming, the price will go up and this is exactly what was happening,” Dr Bawumia said. This, he said, was one of the seven actions the government needed to do for the IMF board before the completion of the IMF programme this year. He also announced the government had lessened the tax burden on Ghanaians, thereby bringing some relief to Ghanaians. Dr. Bawumia further stated the economic fundamentals of the country were strong and that, it was not only good on paper but impacting Ghanaians positively. But Mr Abraham Koomson disputed such claim, explaining that living standard had risen that many Ghanaians workers could not provide a 3-sqaure meal for their families because of the high prices of food stuff. He also said the cost of services had also gone up because the cedi had suffered heavy depreciation in the past few months. Ghana's Cedi had depreciated immensely against major trading currencies in the past month, raising questions about the competency of Akufo-Addo and his cousin, Ken Ofori-Atta who is the Minister for Finance. But it has been relatively stable in the past 2 weeks because government secured a 3 billion dollar Eurobond and part of it was used to shore it up. However, that has been criticized by financial experts, including Bolga Central Legislator Isaac Adongo. Although the cedi has appreciated a bit, Mr Koomson said it's effects had not reflected in the prices of goods and service, adding that the government has been "lying to Ghanaians on the real economic indicators." "They should tell us the truth because we are suffering...Let me tell you, people are feeling the hardship that they can't raise 20 cedis. Some people shockingly send messages and request for 20 cedis because they are suffering... I receive such calls than I have received in the past years," Mr Koomson revealed.